I am not sure what they actually do and if I need to buy a replacement one or can go without on both sides. Also I have been trying to find a diagram break down of the parts as I have seen on some photos of the calipers the bolts that hold them to the bracket have a long skinny rod that pokes through but on the photos is shows some extra cap or cover thing. Mine didnt have them. I presume the calipers may have been taken off during the partial resto in the USA but not put back on properly after and the parts are missing. Would anyone have a photo of the front disc bolts or assembly pieces needed. Hi from a fellow N. Z. 'er ( now Aussi ) I had a similar problem with these plates all bent out of shape. 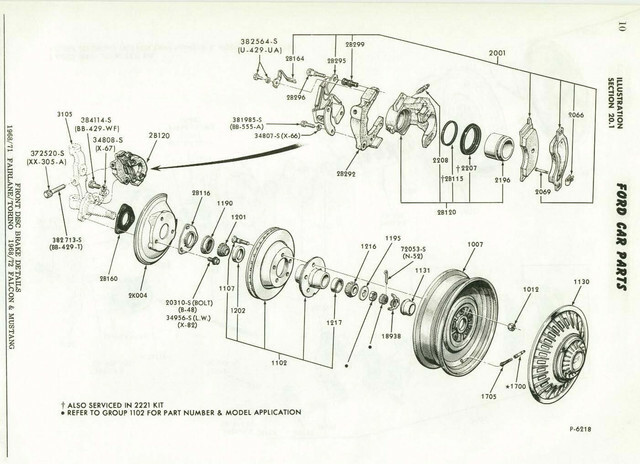 You can get what I recall is known as a " disc brake re-build kit ". It will ( should ) have the two cover plates plus all new bolts, the rubber anti - rattle grommets and some other bits I can't remember. It's not expensive and will give you all new stuff. Try that Mustang Centre in Ch. Ch. ( used to be in Auck but sold out to these guys ) I have a September Petrolhead mag which has a 'phone number of 03 3813 289. If you don't have any success, come back and I'll point you to a couple of Aussi suppliers with stock code numbers, prices etc. Good work on this job of yours. Nearly as challenging as Fabrice. The caliper shield is the "caliper stabilizer" and is part of the system. Keeps the caliper from banging around on rough roads among other things. As noted, it's part of a kit, Here's the listing on Rock auto for reference. Pins are the caliper guide pins, and slide into the rubber boot on the caliper. (12-02-2018, 09:10 AM)Hemikiller Wrote: The caliper shield is the "caliper stabilizer" and is part of the system. Keeps the caliper from banging around on rough roads among other things. As noted, it's part of a kit, Here's the listing on Rock auto for reference. Absolutely - do your homework. For your info: Brisbane source has price of AU $ 99.00 for two complete sets ( both sides ) but " no stock " at this time. Could change tomorrow if next container arrives. Sydney supplier has price of AU $39.15 per side but no image to check components although he does include a Ford part number. Both call them " disc brake hardware kit ". Understand the US prices versus arrival at your door. I allow factor of 3 ( US $100 = AU $300 ) by the time I get it. AU $ + postage may help ? I do have the old bolts but as new ones were only $2.50 a set and have the fresh loc tite on them. Thanks so much guys. I had been searching the replacement parts on CJ Pony but wsa having no luck. Here is a pic with that shield on an actual caliper. Just curious... did you have any braking issues when you didnt have that shield on place? Like dragging brake pads or similar. Only reason I ask is that I'm redoing my brakes and in looking at the how the caliper operates it seems like that shield is really a necessary part of the whole caliper. As the piston pushes the brake shoe against the rotor, you can see the shield flex so that when the piston retracts, the brake shoe is pulled away from the rotor. Granted the slide pins are lubed properly to allow that movement to happen smoothly. Here are the caliper pins and rubber insulators. No the car was just a rolling shell. Dash in but no motor. Old rotors and brake calipers were on but when I had to replace the whole front assembly I just unbolted the calipers without paying attention as the rubber boot things (what you circled) were missing and the bolts were caked in grease and brake dust. I just noticed one of the shields wasn't on one of the calipers. They had all the clips on though. Looks like you have already ordered your caliper parts. I had mine rebuilt by a Perth brake rebuilder and they are the same parts as our local Falcon XY/XA with the Kelsey Hays calipers. Disc pads and rotors also same but some disc rotors come with the earlier falcon bearing cups but you just knock these out and install XA falcon ones.